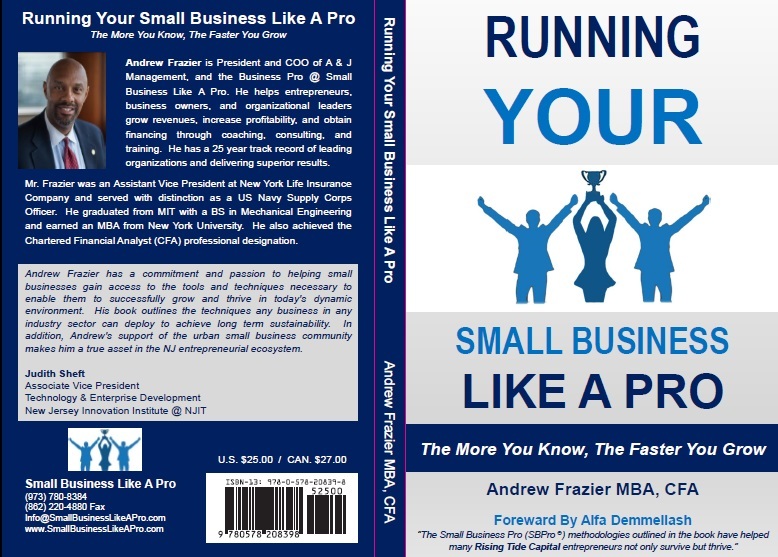 Andrew Frazier, MBA, CFA, SBPro - Book Signing on March 3rd @ Two Ques in Union, NJ. Marlin Woods, featured guest speaker at the POWER BREAKFAST in Newark, NJ on March 8th. I look forward to a great discussion and an opportunity to share valuable insights. Everyone wants to win but unfortunately that is not possible. What is it that separates winners from losers and how do you make yourself more likely to win than others? That is the million dollar question! Since these things are easier said than done, my "Small Business Pro (SBP)" coaching methodology is based on helping business owners in these 3 critical areas. Most entrepreneurs need help from a competent business consultant with an objective/external perspective in order to do these things effectively. They also need to further develop their business knowledge, skills, and capabilities through coaching. In addition, certain members of their team may also require additional training. I look forward to participating as a panelist at Frederica Peterson's Shifting the Atmosphere Event on "Small Business Savvy." You are welcome to come out and join us on Friday evening evening in Montclair, NJ. It is a great opportunity to learn more about small business and connect with some great people. I hope to see you there. March 15th (Friday) - Shifting the Atmosphere "Small Business Savvy"
As a small business coach and consultant, I have been surprised to find that many small business owners don't really focus on increasing the value of their company. Instead they are mired in the day-to-day activities (working in their business) or just trying to survive rather than working on growth (working ON their business). This is a big mistake because they are the ones who will also be upset when they have significant difficulties trying to hire employees, obtain financing, and/or sell their business. My favorite quote is "Failing to Plan is Planning to Fail." If you to not have plans to grow the value of your business, it is unlikely that you will be successful and probably won't make it very long. Plus, it will become a frustrating experience since you will most likely have cash flow issues. The key to successful planning is starting with the end in mind. My Mom used to always say that "If you don't know where you are going, any road will get you there." You could end up anywhere without a road map or plan. As a business owner or organizational leader your most important responsibility is to grow the company by focusing on bringing money in (sales and marketing). However, you must also focus on the bottom line to ensure profitability. The value of your business is directly related to your sales and profitability levels and growth rates, with profitability having the greatest impact on your business valuation. One reason small businesses do not plan to increase the value of their business is because they don't know how to do it. I help entrepreneurs understand their business model and be more strategic. We assess where they are and envision the future of their business more clearly. From there we work on growing revenues, increasing profitability, and obtaining the financing needed to achieve their goals. 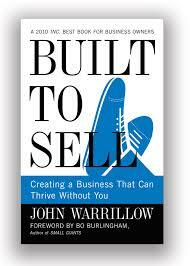 "Built to sell" a best seller by John Warrillow is a great book for explaining what it takes to maximize the value of your business. In the book he outlines the 8 most important drivers to focus on in order to maximize the value of your business. 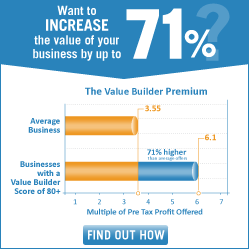 He also created the Value Builder Program for working with business owners to increase the value of their business as much as possible. Over the years it has been proven successful in significantly increase the value of businesses and make them more salable. You'll have to join us on May 4th to learn the other five. I look forward to seeing you there. However, we also post a video of his entire talk on the Small Business Like A Pro website within a week after the event if you cannot make it. Make sure to register before this weekend to take advantage of advance ticket pricing. Also, you may want to participate in the full day conference activities throughout the day. 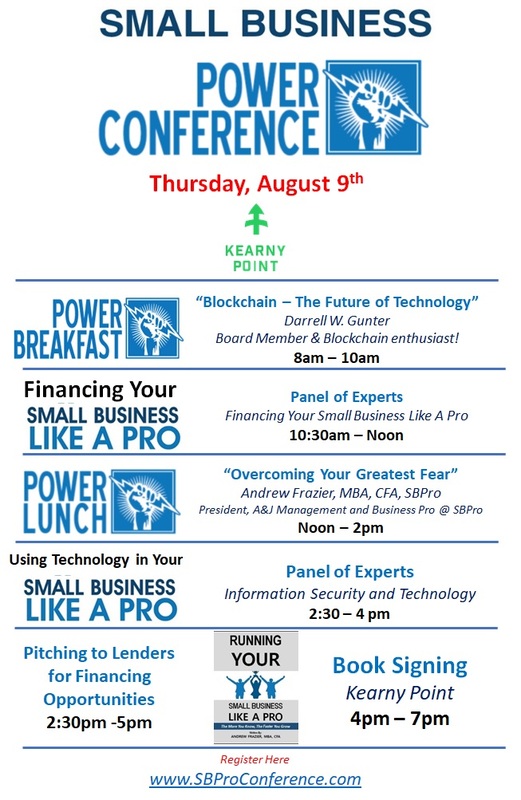 Kearny, NJ – August 9, 2018 – Entrepreneurs, business owners, and organizational leaders will convene from 8am – 6pm on Thursday August 9th at Kearny Point for the POWER BREAKFAST and Conference. The Conference provides a forum for them to engage with other small business owners to learn best practices, enjoy great networking, and gain useful knowledge. Darrell W. Gunter, the President and CEO of Gunter Media Group is the featured guest speaker at the POWER BREAKFAST. He will speak on the topic “Blockchain - The Future of Technology.” He is a “digital publishing” executive with extensive experience in leadership, strategy, sales, marketing, and technology in the digital publishing industry. He is a frequent speaker and moderator at industry events. He also serves as Director, North America, for the International Association of STM Publishers. His radio show Leadership with Darrell W. Gunter airs at 8:00am every Saturday on WSOU HD 89.5 FM/WSOU.net. Andrew Frazier, MBA, CFA, SBP is President & COO of A&J Management and the Business Pro at Small Business Like A Pro will speak during the POWER LUNCH on “Overcoming Your Greatest Fear” as a small business owner. The lunch will be streamed live on Facebook starting at 12:30pm. Mr. Frazier is also a founder of the POWER BREAKFAST series and has been producing the events for 9 years. He is launching his first book, How to Run Your Small Business Like A Pro during the event and will conduct a book signing from 4pm-6pm. There are also two panel discussions during the day. The morning panel will discuss “Financing Your Small Business Like A Pro” and is moderated by Alex Marin, VP, Spencer Savings Bank. The afternoon panel will address “Using Technology in Your Small Business Like A Pro” and is moderated by Arthur Jones, Principal Consultant, The Art of Standing Out, LLC. A select group of small business owners will have the opportunity to pitch their business’s growth plan to a panel of lenders in order to develop relationships that could lead to potential financing opportunities. The lenders are event sponsors and partners which include: Columbia Bank, Spencer Savings Bank, M&T Bank,UCEDC, and GNEC. The pitch sessions will take place from 2:30pm to 5pm. The Power Breakfast & Conference will be held at Kearny Point, NJ’s newest business district. The Power Breakfast & Conference Series brings together business thought leaders and speakers from across the country to share expertise in their respective fields and incorporates local leaders and experts into the conversation. Registration and sponsorship can be completed online at http://www.sbproconference.com Please contact Andrew Frazier at andrew@SmallBusinessLikeAPro.com for additional information. Click here to view article in its entirety. 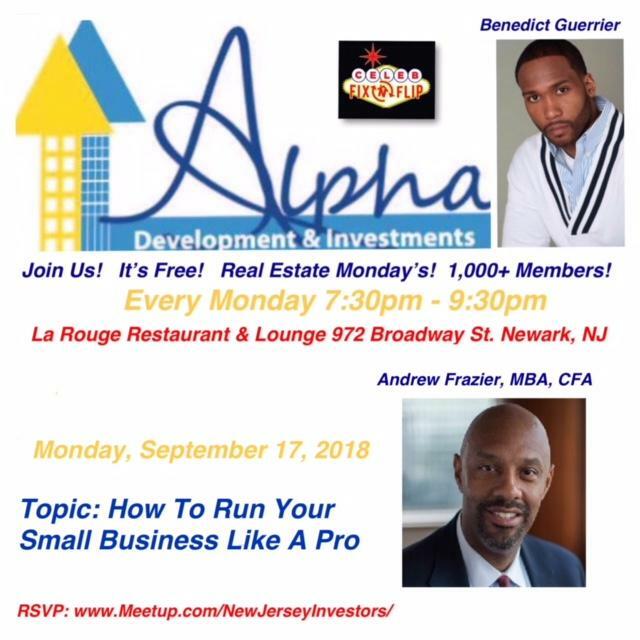 Excited about the opportunity to be the featured guest speaker for the Real Estate Monday Meet-Up @ La Rouge in Newark, NJ. Please come out and participate to learn best practices, enjoy great networking, and gain useful knowledge. I look forward to sharing the secret to small business success as outlined in my new book "Running Your Small Business Like A Pro."